Anti-cancer therapy is classified to radiotherapy, surgical resection and chemotherapy. 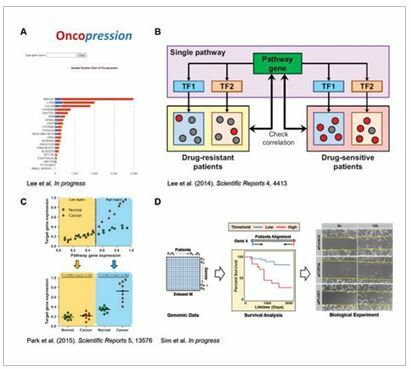 Although anti-cancer chemotherapy is widely accepted as the most efficient treatment for cancer patients, genomic heterogeneity of cancer cells or chemoresistance caused by persistent drug treatments lead to chemotherapy failure. Thus, a combination therapy consisting of more than two anti-cancer drugs has been widely investigated to improve the efficiency of chemotherapy. In this laboratory, we have examined several combinations of anti-cancer drugs for maximization of treatment efficiency by inducing synergistic effects within anti-cancer drugs. We aim to construct a selection system for highly effective drug combination based on bioinformatics analysis, verify the efficiency of selected drug combinations in cellular and in vivo levels, and then demonstrate the intracellular signaling mechanisms of the drug combinations showing anti-cancer synergism. In particular, among various types of cancer, we have been focusing on glioblastoma mutiforme (GBM), the most aggressive primary malignant brain tumor, which has infiltrative characteristics in the tumor microenvironments. Due to the greatly diffusive behaviors, definitive surgical resection is precluded, therefore, recurrence occurs frequently, and overall survival is quite short. For improvement of GBM prognosis, we aimed to investigate GBM cell behaviors, specifically focusing on the invasive characteristics by constructing in vitro and in vivo validation models in this laboratory. First, in vitro cell culture system: GBM cells migrate along preexisting thin microstructures and invade surrounding normal tissues. 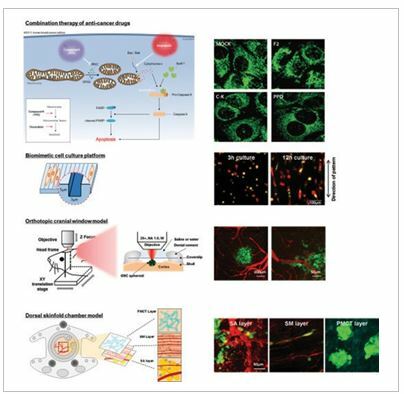 Therefore, we established the biomimetic cell culture platform to mimic these structural and mechanical cues in tumor micro-environments of GBM. The biomimetic system induced cytomorphological changes and migration along the pattern. Second, two in vivo intravital models: GSCs, a subpopulation of tumor stromal cells with self-renewal properties and pluripotency, exhibit unique behaviors near microvessels, otherwise known as the “perivascular niche”. 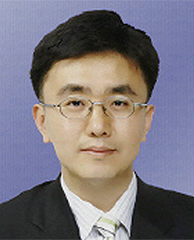 However, it has not been identified whether GSCs migrate along microvessels like tumor cells. To monitor the GSC behaviors near the vessels, we constructed an orthotopic cranial window model and a dorsal skinfold chamber model for a GSC invasion study. Near-infrared light imaging technique has several advantages to monitor bio-signals. It uses bio-safe wavelength so it can be used in clinics. Moreover, NIR light can penetrate into deep tissue so it is easy to detect the signal from deep tissue. Our lab currently studying the blood flow and perfusion analysis using Indocyanine green, ICG, as a blood tracer. ICG is a FDA-approved fluorescent dye and has been used in clinics for decades. It is excited with IR range light so it can provide deep tissue perfusion information. For acquiring ICG time-series images, volunteer take a rest at room temperature for several minutes, and put his feet and hands into the imaging machine. After that, ICG bolus injection is taken with intravenous injection, and simultaneously, NIR imaging is taken. Acquired time-series ICG fluorescent dynamics are analyzed by computational process, and finally blood flow characteristics are extracted to diagnose vascular insufficiencies. (Figure 1) Because ICG binds with plasma protein when it is introduced into the vessel, it cannot go out from the vessel lumen normally. Therefore, analyzing ICG dynamic flow can represent blood flow not only the structural characteristics but functional characteristics. It has been proven previously that peripheral arterial occlusive disease (PAOD) and Raynaud’s phenomenon (RP) can be diagnosed by ICG fluorescence imaging. (Figure 2) PAOD represents structural deficiency and RP represents functional problem of vascular disease. 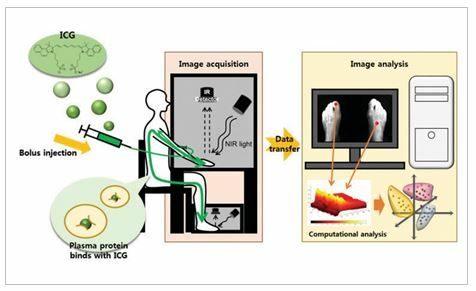 Therefore, analyzing ICG fluorescence dynamics can provide more information about various vascular diseases and it is a promising research tool for vascular insufficiency. was fused to a cargo protein and CIBN was conjugated with exosome marker CD9 protein. Despite the long list of therapeutic proteins available for treating various human diseases, the vast majority of commercial protein-based drugs, such as cytokines, hormones, and monoclonal antibodies, have been limited to extracellular mechanisms of action. Many intracellular proteins with great potential as biopharmaceutical drugs have been identified; however, many of the challenges associated with intracellular protein delivery in vivo have yet to be solved. On the one hand, there are cell-derived natural carriers that can deliver nucleotides and proteins and participate in intercellular communication. These key mediators are called extracellular vesicles (EV) and have a spherical shape which is composite of lipid bilayers. EVs can be classified according to their structural and biochemical properties, 1) microvesicles and 2) exosomes: which have hydrodynamic sizes of 50 – 200 nm and are originated from internal endocytic compartments and multi-vesicular bodies. In our laboratory, by integrating a reversible PPI module controlled by blue light with the endogenous process of exosome biogenesis, we were able to successfully load cargo proteins into newly generated exosomes. Using this method, we can easily produce protein-loaded exosomes by a simple transfection and blue LED illumination. Not only this method is the first technology that can stably load cargo proteins into extracellular vesicles, but also this technique can approach to naturally and massively obtain protein-loaded exosomes. We succeed the intracellular delivery of various functional proteins such as Cre recombinase in the target cells and in vivo, and are now testing the EXPLOR drugs for treating various human diseases.